Trying to come up with creative ways to cook in the heat has actually inspired two new recipes. 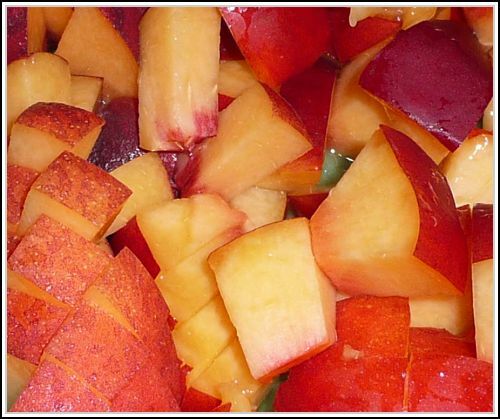 Use what ever vegetables you have in your fridge or look fresh at the store. 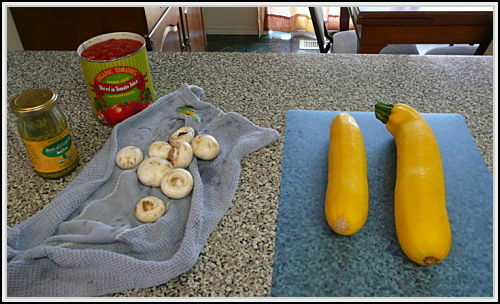 I used beautiful yellow zuchini squash from a friends garden, canned tomatoes (fresh would have been better but I didn’t have any) and mushrooms. 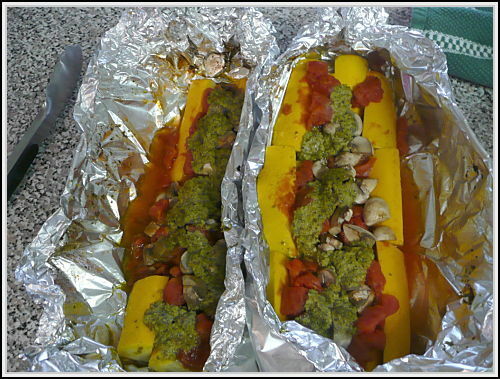 Coat some aluminum foil with olive oil, then cut up your vegetables and place on the foil. I spread a generous helping of pesto on top. 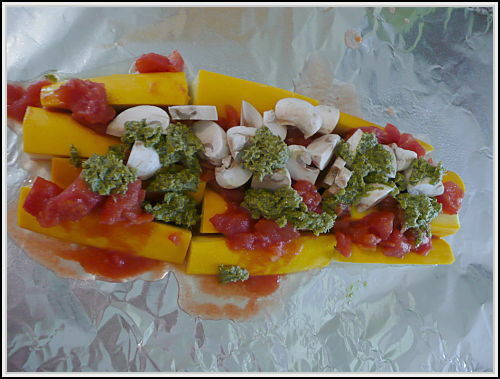 Seal up the foil and roast on a grill on medium until vegetables are desired consistency. Cooking time will vary by grill. Mine took about 10 minutes and still had a bit of crunch which is how I like them. The next night I made burritos and wanted to roast some more veggies for them and this time I just chopped up the zuchini, added fresh chopped tomatoes, mushrooms and onions and a bit of olive oil. Came out fabulous and was a great addition to the burritos. Directions: mix the smashed ginger cookies into the melted butter (I used the about 2/3 of the container of cookies) the mixture should be crumbly and just stick together slightly. you don’t want it wet with butter ad more cookies if it isn’t still crumbly. 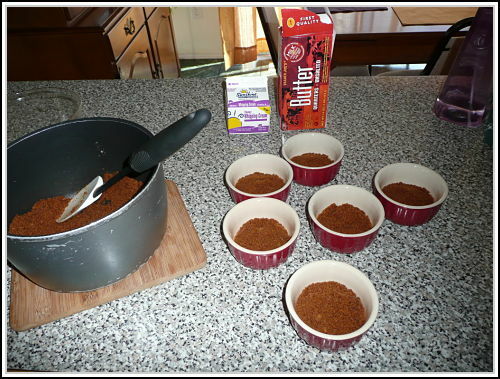 Then spoon about 1/2 inch of buttered crumb mixture into greased ramekins or if you don’t have ramekins small bowls or mugs will work. 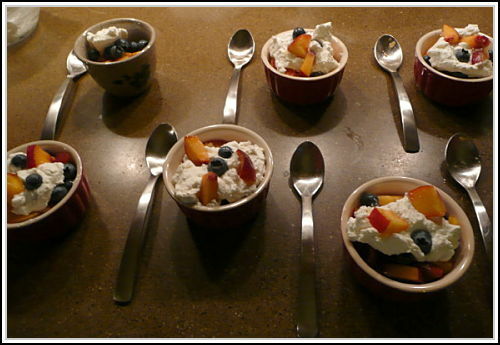 Put these in the fridge to harden for at least 2 hours can stay in fridge up to 2 days if you want to make ahead of time. 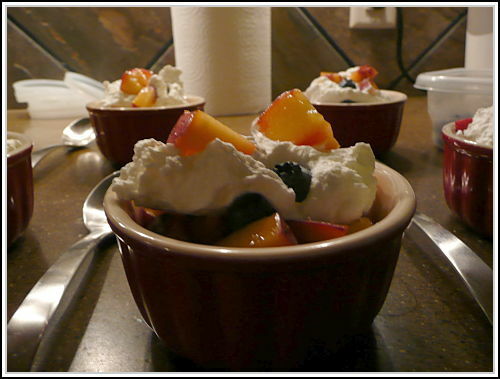 once chilled spoon in the fruit mixture, a layer of whip then another layer of fruit until cups are full. Easy Delicious and no hot oven needed. 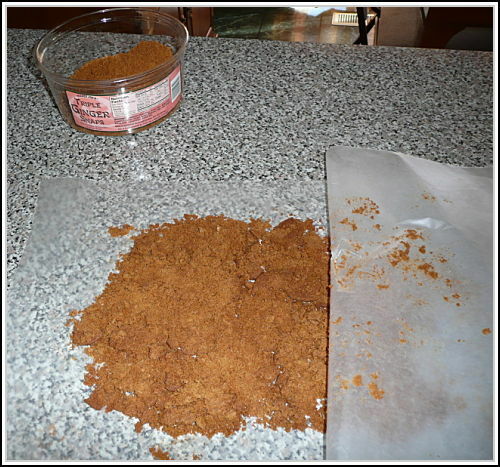 the smashed cookies, I do not have a food processor so I just smash them with a rolling pin in between waxed paper. Putting the buttered crumbs into the ramekins. Close up to show off the whipped cream goodness. Hmm, I know where that zucchini came from! 🙂 And I’m definitely going to have to give that “naughty” recipe a try too. Yummo.